The girls had some supervised play on Daddy’s lap. Today Emily was pointing at different features on Julia’s face and named a few of them for me. I guess she was showing off. 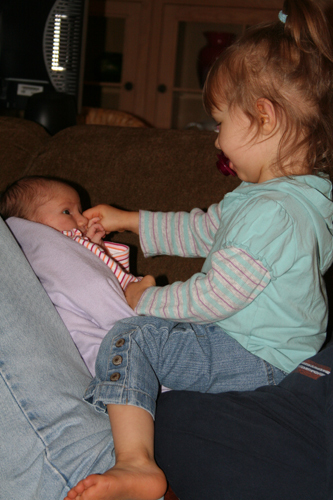 While I was proud that she knew the names, I was most glad that she pointed at Julia’s eye and didn’t poke it. Who knew that they second kid was going to be such a good educational tool. Julia’s milestone for today is that she finally lost her umbilical cord. Tub baths for Julia now! !